I’m not sure how or why but we were talking about the Berlin Wall at work and Communism and the Cold War and such. 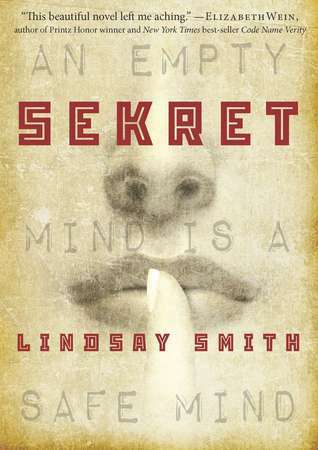 The point is, I was in the mood for a nice communist spy drama and Sekret by Lindsay Smith has been on the list for months and I figured why not. Seventeen year old Yulia knows she must hide her thoughts and control her emotions to survive in Communist Russia. Her father always told her that an empty mind is a safe mind. Little does she know that Russia’s powerful spy agency, the KGB, is recruiting young people with mind-reading capabilities for their psychic espionage program and Yulia is their next “recruit”. Of course, the KGB would use any means necessary to make the young psychic cooperate. Anything to beat the American capitalist scum. I love the balance of historical fact and psychic fiction. Set in the late 1960’s, this Cold War kid thought Smith really captured the time period and environment well. Like any great communist spy drama, you don’t know who to trust. Smith does a great job keeping you guessing as to where everyone’s loyalties lie. I could have done without the love triangle, it didn’t really add much to the story. But other than that, it was a fun and enjoyable read. This entry was posted in Historical Fantasy, Young Adult and tagged KGB, Lindsay Smith, psychic espionage, Sekret. Bookmark the permalink.